^ "American FactFinder Help: Race". United States Census Bureau. Retrieved September 13, 2017. ^ "American FactFinder Help: Hispanic or Latino origin". United States Census Bureau. Retrieved September 13, 2017. ^ a b c d e "Questions and Answers for Census 2000 Data on Race". United States Census Bureau. March 14, 2001. Archived from the original on April 5, 2001. Retrieved April 25, 2010. ^ a b c d "A Brief History of the OMB Directive 15". American Anthropological Association. 1997. Retrieved May 18, 2007. ^ a b "American FactFinder Help: Ethnic Groups". United States Census Bureau. Retrieved September 13, 2017. ^ "American Anthropological Association Response to OMB Directive 15:". Race and Ethnic Standards for Federal Statistics and Administrative Reporting. Retrieved December 7, 2012. ^ "Revisions to the Standards for the Classification of Federal Data on Race and Ethnicity" (PDF). Office of Management and Budget. October 30, 1997. Retrieved October 7, 2008. ^ a b c d e f g h i j k l m n o p "Through the Decades". United States Census Bureau. Retrieved January 18, 2012. ^ "US Census Bureau, 2000" (PDF). Archived from the original (PDF) on October 20, 2003. 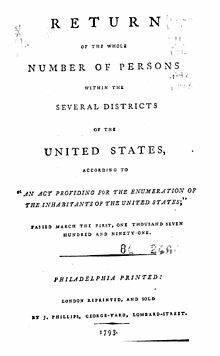 ^ a b c d e f g h i "2000 Census of Population, Public Law 94-171 Redistricting Data File: Race". US Census Bureau. Archived from the original on August 31, 2009. Retrieved January 5, 2010. ^ a b "2010 US Census form" (PDF). Retrieved March 15, 2010. ^ "Census Bureau to Test Changes in Questionnaire, New Response Technology" (Press release). US Census Bureau. January 16, 2003. ^ The Washington Diplomat. "Census Takes Aim to Tally 'Hard to Count' Populations". Retrieved May 5, 2011. ^ "The Arab American Institute | Get Involved!". Archived from the original on May 26, 2010. Retrieved March 15, 2010. ^ Ashmawey, Roqaya (March 1, 2010). "Arab-Americans Aim to Increase Their Census Count". Retrieved March 14, 2010. ^ SMITH, DOUG (April 5, 1990). ""They ask, 'Where are we going to write Armenian? ' "" – via LA Times. ^ "OMB Standards". White House. Archived from the original on March 15, 2012. Retrieved April 25, 2010. ^ "Amendment: NIH Policy and Guidelines on the Inclusion of Women and Minorities as Subjects in Clinical Research". National Institutes of Health. October 9, 2001.